If you live in the UK, then hopefully you are aware that Windows Phone 7 launches tomorrow. Anyone who has been near me for the past few months will not have failed to know about this. It is all I talk about, and something I’ve been gearing up for over the last few months. Back in May, I blogged about how Windows Phone 7 would knit your social universe together in one device. Well – the time is nearing where we, the general public, can get our hands on these phones – launch day is tomorrow! 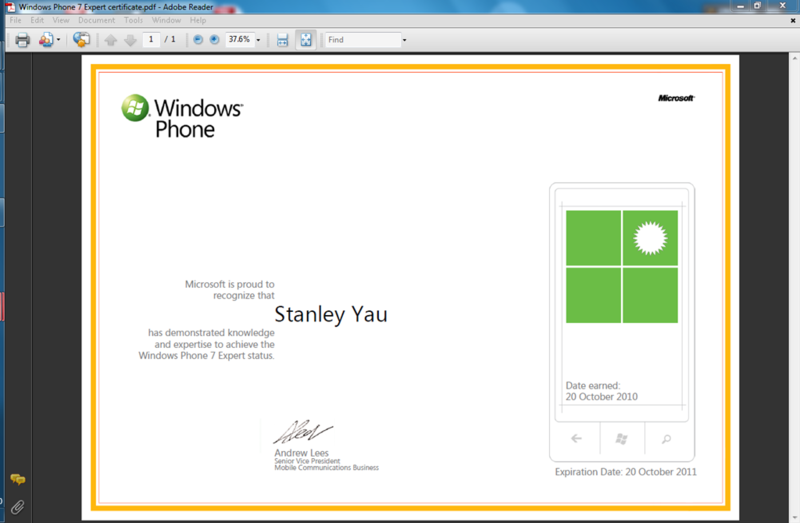 Yes – as of Thursday, 21st October 2010 – you will be able to buy Windows Phone 7 handsets from your local store, or online. I have two handsets lined up for myself from Orange – the Samsung Omnia 7 and the HTC 7 Mozart. If you want to know more about Windows Phone 7, discover the major features here. Engage with the community at the official Windows Phone UK Facebook page, and chat with like-minded individuals at the Windows Phone Backstage forums. And finally – I’d recommend avoiding me in the near future if you don’t want to get oversaturated with demos of what Windows Phone 7 can do. In addition to having two handsets to demo, I’ve also today become a "Windows Phone 7 Expert” and will fire all my newly learned sales patter directly at you!